Background and objectives We examined the effect of alkali replacement for metabolic acidosis on vascular endothelial function in patients with CKD. Methods We performed a pilot, prospective, open-label 14-week crossover study examining the effect of oral sodium bicarbonate treatment on vascular function in 20 patients with an eGFR of 15–44 ml/min per 1.73 m2 with low serum bicarbonate levels (16–21 mEq/L). Each period was 6 weeks in duration with a 2-week washout period in between. Patients were treated to goal serum bicarbonate of ≥23 mEq/L. The primary end point was change in brachial artery flow-mediated dilation (FMD) between treatment and control conditions. Secondary end points included changes in markers of inflammation, bone turnover, mineral metabolism, and calcification. Results Eighteen patients completed the study and were included in the primary efficacy analysis. The mean (SD) age and eGFR were 59 (12) years and 26 (8) ml/min per 1.73 m2, respectively. Serum bicarbonate increased significantly with sodium bicarbonate treatment (+2.7±2.9 mEq/L, P≤0.001), whereas there was no change in bicarbonate levels in the control group. FMD significantly improved after sodium bicarbonate therapy (mean±SD, FMD baseline: 4.1%±4.1%; 6 weeks: 5.2%±2.9%; P=0.04) There was no significant change in FMD in the control group (mean±SD, FMD baseline: 4.6%±3.1%; 6 weeks: 4.1%±3.4%; P=0.20). Compared with control, sodium bicarbonate treatment resulted in a significant increase in FMD (mean, 1.8%; 95% confidence interval, 0.3 to 3.3; P=0.02). There was no significant change in bone markers or serum calcification propensity with treatment. Serum phosphorus and intact fibroblast growth factor 23 increased significantly during treatment. Conclusions Treatment of metabolic acidosis with sodium bicarbonate significantly improved vascular endothelial function in patients with stages 3b and 4 CKD. Cardiovascular disease is the leading cause of death in patients with CKD (1). Dysfunction and disorders of arteries are key contributors to cardiovascular disease in patients with CKD (2). Patients with CKD demonstrate impaired vascular endothelial function and increased arterial stiffness (3–7). The pathogenesis of these arterial dysfunctions can only be partially explained by traditional cardiovascular risk factors, suggesting a mechanism related to kidney dysfunction. Acid retention is a common complication of CKD resulting from an inability of the diseased kidney to excrete the daily dietary acid load (8). The subsequent acid retention results in unfavorable effects, including increased inflammation (9–11) and activation of the renin-angiotensin-aldosterone system (12–15). Observational studies have reported associations between lower serum bicarbonate levels, even within normal laboratory range, and increased risks of endothelial dysfunction (16), hypertension (17,18), heart failure (19), and death (20,21). Small, randomized trials have shown that alkali therapy slows progression of kidney disease in patients with low serum bicarbonate levels (22–24). Because risk factors for cardiovascular disease and kidney disease progression often overlap, it is biologically plausible that alkali therapy in patients with CKD may also result in improved cardiovascular outcomes. No interventional trials have been performed examining the effect of alkali therapy on vascular endothelial function in patients with kidney disease. We performed a prospective, randomized, crossover pilot study in 20 patients with CKD stages 3b and 4 (eGFR 15–44 ml/min per 1.73 m2) to test the hypothesis that treatment of metabolic acidosis (defined by low serum bicarbonate levels of 16–21 mEq/L) with oral sodium bicarbonate therapy improves vascular endothelial function (measured by brachial artery flow-mediated dilation [FMD]) compared with no treatment. Participants were enrolled between January of 2014 and March of 2016 at the University of Colorado Anschutz Medical Campus. Eligibility criteria included participants with age between 18 and 80 years; eGFR 15–44 ml/min per 1.73 m2; metabolic acidosis, as defined by a serum bicarbonate level of <22 and ≥16 mEq/L on at least two consecutive weekly determinants; body mass index <40 kg/m2; and the ability to give informed consent. eGFR was calculated using the four-variable Modification of Diet in Renal Disease equation. All participants were required to have stable antihypertensive, diabetic, and lipid-lowering regimens for at least 1 month before randomization. For women, participants could not be pregnant, breastfeeding, or unwilling to use adequate birth control. Exclusion criteria included significant comorbid conditions that led the investigator to conclude that life expectancy was <1 year; uncontrolled hypertension; overt congestive heart failure; use of sevelamer (25); use of alkali therapy, including sodium bicarbonate, calcium carbonate, sodium citrate, or potassium citrate; and expectation to undergo living, related kidney transplant in the next 6 months. All participants provided written informed consent before study entry. The study protocol and informed written consent were approved by the Colorado Multiple Institutional Review Board (Aurora, CO) and were registered at ClinicalTrials.gov (NCT02031770). The study was a 14-week, open-label crossover study (Figure 1). Participants who met eligibility criteria and provided informed consent were randomized 1:1 to either start with treatment or control. A blinded statistician generated the randomization schedule. Each patient served as their own control. Each treatment period was 6 weeks in duration with a 2-week washout period in between. No medication was taken during the control period. Outcome measures were repeated at the beginning and end of each period. Serum bicarbonate levels were checked every 2 weeks in the treatment arm. Participants were treated with oral sodium bicarbonate two to three times per day for a goal serum bicarbonate of ≥23 mEq/L. Commercially available oral sodium bicarbonate was used. Each tablet contained 650 mg (7.6 mEq) sodium bicarbonate. The dose of sodium bicarbonate used was individualized for each patient and the initial dose was determined by the patient’s bicarbonate deficit, using the following equation (26) on the basis of the bicarbonate distribution space: Bicarbonate deficit=0.5×weight (kg)×(23−serum bicarbonate [mEq/L]). Depending on the dose needed, participants took the medication two to three times per day. Serum bicarbonate levels were drawn every 2 weeks during the treatment period and the dose of bicarbonate was adjusted accordingly to maintain levels ≥23 meq/L. If the serum bicarbonate reached a level >27 mEq/L, the dose of sodium bicarbonate was reduced by 50%. The maximum dose given was nine tablets per day. The primary end point was absolute change in brachial artery FMD between treatment and control conditions. Secondary end points were used to test different pathways (i.e., inflammation and mineral bone disease) to better understand the mechanism by which bicarbonate may affect FMD. Secondary end points included changes in high-sensitivity serum C-reactive protein (hs-CRP), IL-6, intact parathyroid hormone (iPTH), calcium, phosphorus, intact fibroblast growth factor 23 (iFGF23), calcification propensity (T50), C-telopeptide (CTX), and procollagen type 1 amino-terminal peptide (P1NP) between treatment and control conditions. Conduit artery endothelial-dependent dilation was determined by a trained technician using brachial artery FMD using high-resolution ultrasonography (Toshiba Xario 200) as described originally by Celermajer et al. (27) and more recently by our group (28,29). Measurements were performed at least 4 hours after ingesting food and tobacco and 24 hours from ingestion of alcohol, caffeine, or exercise. Electrocardiogram-gated end-diastolic ultrasound images were acquired during baseline and FMD conditions. For FMD, reactive hyperemia was produced by inflating a pediatric forearm cuff around the forearm to 250 mm Hg for 5 minutes, followed by rapid deflation. Conduit artery endothelium-independent dilation was determined by measuring brachial artery dilation for 10 minutes after administration of sublingual nitroglycerin (0.4 mg). A commercially available software package (Vascular Analysis Tools 5.10.10; Medical Imaging Applications, LLC, Iowa City, IA) was used to concurrently acquire electrocardiogram-gated brachial artery diameters. Brachial artery dilation was determined as percent change from baseline. Fasting blood samples were collected at the beginning and end of each treatment period. Serum hs-CRP was measured on a Beckman Coulter analyzer. IL-6 was measured by ELISA (R&D Systems). Serum iPTH was analyzed using the Beckman Coulter DxI analyzer. iFGF23 was analyzed using the Kainos Human FGF-23 ELISA kit. Serum CTX and intact P1NP were analyzed by chemiluminescence from Immunodiagnostics Systems. Serum T50 was measured using a Nephelostart nephelometer (BMG Labtech, Offenburg, Germany). T50 measures the transformation time of amorphous calcium phosphate–containing primary calciprotein particles to crystalline hydroxyapatite–containing secondary calciprotein particles (30). A higher T50 represents lower calcification propensity. During treatment, participants were seen every 2 weeks for safety visits, which included vital signs, serum bicarbonate measurement, and adverse event assessment. A pill count for adherence was also performed. If serum bicarbonate was >27 mEq/L, the dose of serum bicarbonate was reduced by 50%. Baseline characteristics are reported as mean±SD or, when appropriate, median (interquartile) for continuous variables and as a number and percentage for categoric variables. For an outcome variable that was not normally distributed and with some very large values, log-transformed values (hs-CRP, IL-6, parathyroid hormone, and iFGF23) were used in efficacy analyses. Efficacy analyses were conducted in all randomized patients who completed the entire study (n=18). Time points used for the analyses included beginning and end of each 6-week study period. We assessed carryover effect using the method provided by Wellek and Blettner (31). Furthermore, mixed effects models were used to examine changes in study end points between treatment and control conditions with the considerations of repeated measure, in which the effects of intervention, sequence, and period are fixed and the effect of individual is random because of repeated measures on individuals of random sample. All participants were included in analysis of adverse events. All analyses were performed using SAS software, version 9.4 (SAS Institute Inc.). On the basis of previous studies (16) demonstrating a decrease in FMD of 3.9% during acidotic conditions compared with control conditions in seven healthy males (mean±SD FMD 4.1%±3.6% versus 8.0%±3.0%, respectively), we estimated that treatment with sodium bicarbonate would result in an average absolute change in FMD of 3.9% compared with control conditions with an SD of 4. A sample size of 20 patients provided 98% power to detect a mean difference change in FMD of 4% using a two-group t test with a 0.05 two-sided significance level. Twenty patients were enrolled into the study. Two patients did not complete the follow-up assessment (chose not to participate) and were excluded from the analysis. One patient started with control and left the study 4 weeks after the baseline visit and the other patient started with treatment and left 2 weeks after the baseline visit. The initial mean dose of sodium bicarbonate was 0.4 mEq/kg per day (40±17 mEq/d). Baseline characteristics of participants by study group are shown in Table 1. The mean±SD age and eGFR of participants were 59±13 years and 26±8 ml/min per 1.73 m2, respectively. The mean±SD serum bicarbonate level at baseline was 19.5±2.3 mEq/L. Sixty-five percent of patients had a history of diabetes and 100% had a history of hypertension. Forty percent of participants were non-Hispanic black and 30% were non-Hispanic white. Serum bicarbonate increased significantly with oral sodium bicarbonate treatment (+2.7±2.9 mEq/L, P<0.001), whereas there was no change in serum bicarbonate levels in the control period (−0.06±2.44 mEq/L, P=0.93) (Table 2). Eight patients (44%) reached the goal of ≥23 mEq/L at the end of 6 weeks (Supplemental Table 1). Of these eight, four reached the goal by week 2. Several patients reached the goal at either week 2 or week 4, but at week 6 bicarbonate was <23 mEq/L. 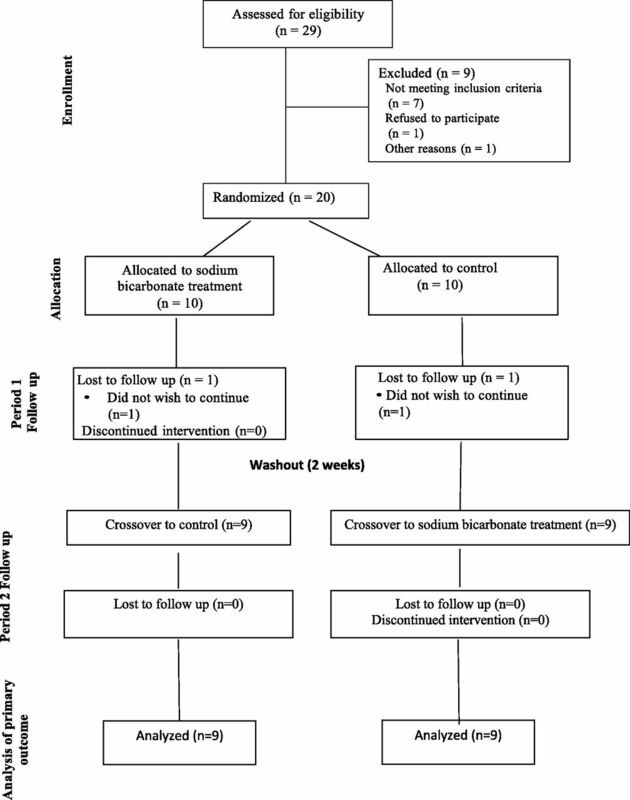 FMD significantly improved after 6 weeks of sodium bicarbonate therapy (mean±SD, absolute change in FMD 1.1±2.6%; P=0.04) (Figure 2, Table 3). There was no significant change in FMD in the control group (mean±SD absolute change in FMD, −0.7±1.9%; P=0.20). Compared with control, sodium bicarbonate treatment resulted in a significant increase in FMD of 1.8% (95% confidence interval [95% CI], 0.3 to 3.3; P=0.02). Endothelium-independent vasodilation (brachial artery dilation in response to sublingual nitroglycerin) was unaffected by sodium bicarbonate treatment (mean±SD change from baseline, −0.05%±5.5%; P=0.33). The order in which participants received treatment did not affect FMD. The estimated carryover effect on FMD was 1.15 (95% CI, −2.16 to 4.46). We did not find any significant association between change in FMD with change in serum bicarbonate (r=0.28, P=0.10). We did not observe any association between a bicarbonate level of ≥23 mEq/L and change in FMD in a pre-post comparison during treatment with sodium bicarbonate (estimated absolute change, 1.2%; 95% CI, −1.06% to 3.41%; P=0.28). Percent flow-mediated dilation at baseline and 6 weeks after sodium bicarbonate administration or control. FMD, flow-mediated dilation. The effect of sodium bicarbonate therapy on secondary end points is shown in Table 2. There were no significant changes in serum levels of hs-CRP, IL-6, or calcium with treatment. There were no significant changes in serum calcium levels during treatment with sodium bicarbonate. Mean (SD) serum phosphate levels increased significantly with sodium bicarbonate therapy but did not change in the control group. Serum iFGF23 levels increased significantly during treatment with sodium bicarbonate, whereas there was no change in iFGF23 levels during the control period. There was no significant change in serum iPTH levels during either period. There was also no significant change in serum T50, serum CTX, serum P1NP, or eGFR with sodium bicarbonate treatment. We did not find any significant associations between change in serum phosphate or iFGF23 with change in serum bicarbonate. There were no significant order or carryover effects for CRP, IL-6, calcium, phosphorus, iFGF23, iPTH, T50, CTX, or P1NP. There were no significant adverse events in either group. Serum bicarbonate level reached 28 mEq/L in one patient and the dose was reduced by 50%. Study medication did not have to be reduced in any patient due to side effects. The most commonly reported side effect with treatment was mild nausea (n=7, 35%). Four patients (20%) complained of leg swelling during treatment. Of those patients, one patient ran out of diuretics and the swelling resolved once diuretics were restarted. No changes to diuretics were made in two of the four patients and diuretic dose was increased in one patient (from once a day to twice a day dosing). BP did not change during treatment (Table 3). 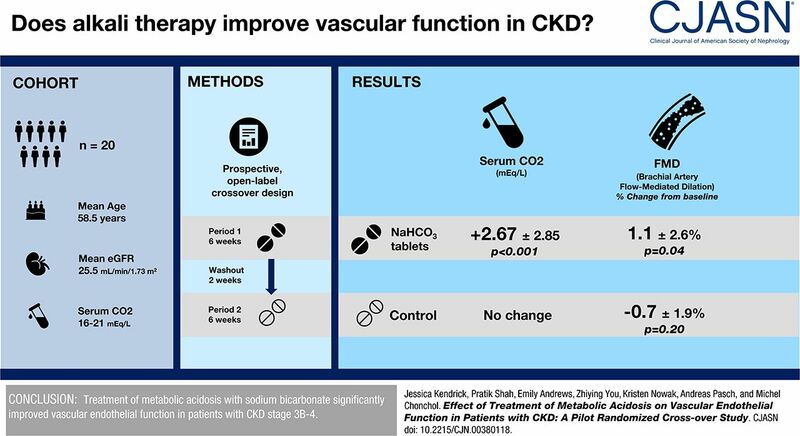 In this pilot, prospective, randomized crossover trial, we found that treatment with oral sodium bicarbonate therapy improved vascular endothelial function measured by FMD in patients with CKD (eGFR 15–44 ml/min per 1.73 m2) with low serum bicarbonate levels. Additionally, we found that sodium bicarbonate treatment resulted in significant increases in serum phosphate and iFGF23 levels. To our knowledge, this is the first interventional trial examining the effect of alkali replacement for metabolic acidosis on vascular endothelial function in patients with CKD. Vascular endothelial dysfunction begins early in the course of CKD (3). Brachial artery FMD is associated with all-cause and cardiovascular mortality in patients with CKD (32). Thus, therapeutic interventions that improve endothelial function in patients with CKD may significantly improve cardiovascular morbidity and mortality. Acid retention is common in patients with CKD because the kidney loses the ability to synthesize ammonia and excrete hydrogen ions (8). Metabolic acidosis may contribute to endothelial dysfunction seen in patients with CKD because it results in increases in inflammation (9–11) and increases production of angiotensin II, aldosterone, and endothelin-1 (12–15). We have shown that treatment with oral sodium bicarbonate in patients with CKD and low serum bicarbonate levels results in a clinically significant increase in brachial artery FMD. A recent meta-analysis found that a 1% increase in FMD is associated with a 13% reduction in risk of cardiovascular events even after adjustment for important confounders (33). The magnitude of change in FMD seen in our study has been found in studies examining the effect of paricalcitol in the CKD population (34). Larger studies are needed to determine whether bicarbonate therapy may be an inexpensive and easy-to-administer option for the management of arterial dysfunction in patients with CKD. The mechanism by which sodium bicarbonate treatment improves vascular endothelial function is unclear. Although metabolic acidosis does increase inflammation (9–11), which results in endothelial dysfunction (35), we did not see any significant changes in inflammation during the treatment period. Metabolic acidosis also adversely affects bone by increasing calcium and phosphate efflux from bone (36). This efflux from bone may result in vascular calcification because there is a strong graded association between the progression of vascular calcification and bone loss (37,38). Hence, treatment with sodium bicarbonate may result in decreased bone turnover. However, we did not find any significant changes in markers of bone turnover or bone formation. Interestingly, we found a significant increase in serum phosphate and iFGF23 during sodium bicarbonate treatment. Fibroblast growth factor 23 (FGF23) is a hormone produced in the bone by osteocytes and osteoblasts (39). In vitro data suggest that metabolic acidosis may play a role in regulating FGF23 secretion. In mouse bone, metabolic acidosis increases FGF23 concentration (40). However, we found an increase in iFGF23 with sodium bicarbonate. Our findings are similar to a study performed by Chen et al. (41), in which they found that 6 weeks of treatment with sodium bicarbonate significantly increased FGF23. Contrary to our findings, they did not find an increase in serum phosphate. A limitation of their study is the lack of a control group. Studies have found that plasma phosphate concentration is positively correlated with plasma bicarbonate concentration (42). Chronic administration of NH4Cl has been shown to increase kidney phosphate clearance (42,43). Data suggest an acidosis-induced kidney phosphate leak. Increasing the serum bicarbonate concentration may have decreased kidney phosphorus clearance, increased serum phosphorus, and subsequently increased FGF23. A concern with the increase in FGF23 and phosphate is the observation that higher concentrations of these variables are associated with cardiovascular disease in patients with CKD (44–46). However, despite the increase of these variables in our study, vascular endothelial function improved significantly. Thus, the elevated phosphate and FGF23 may not be directly toxic. Further studies are needed to determine whether these variables remain elevated with long-term sodium bicarbonate treatment and to elucidate the mechanism by which they increase. The effect of sodium bicarbonate treatment on vascular calcification is currently unclear. Data suggest that metabolic acidosis may induce vascular calcification (12–15,36). However, experimental data have shown that an alkaline pH increases vascular calcification, whereas acidosis inhibits calcification (47,48). Data from observational studies show an increased risk of heart failure and arterial stiffness with higher serum bicarbonate levels (49,50). We measured a novel marker of serum calcification propensity, T50, to determine the overall calcification propensity of serum before and after treatment with sodium bicarbonate. We did not find any significant change in T50. Treatment of metabolic acidosis did not reduce, but importantly also did not increase, calcification propensity. Importantly, positive effects may have been masked by the parallel rise in phosphate concentrations, which are expected to have an opposing effect on calcification propensity. Longer trials are needed to determine whether over time there is a change in vascular calcification with sodium bicarbonate treatment. Our study does have limitations, including the small sample size, with resultant chance of spurious results despite significant P values, and short study duration, whereas in practice patients are treated for much longer than 6 weeks, over which time effects may conceivably vary. Although we did find a significant improvement in FMD, we were unable to determine the effect of sodium bicarbonate treatment on hard clinical outcomes. We did not measure angiotensin, aldosterone, or endothelin-1 levels, which may have helped to determine a mechanism by which sodium bicarbonate improves FMD. We did not perform 24-hour urine collections, so we were unable to determine changes in acid or phosphate excretion. We did not perform arterial or venous blood gases, so we were unable to determine the complete acid-base status of the participants. We also did not collect information on duration of diabetes or hypertension. Finally, it was an open-label study and no placebo was used. This may have introduced bias into the study. However, blinded investigators completed the data analyses. Our study also has several strengths, including that it is a randomized crossover trial that was powered to detect a clinically significant difference in FMD. We also examined markers of inflammation, mineral metabolism, bone, and calcification as possible mechanistic pathways. In conclusion, 6 weeks of treatment with oral sodium bicarbonate significantly improved vascular endothelial function in patients with stages 3b and 4 CKD (eGFR 15–44 ml/min per 1.73 m2). Larger trials are needed to determine whether long-term treatment with sodium bicarbonate therapy will reduce cardiovascular morbidity and mortality in patients with CKD. A.P. is an inventor of the T50-Test. He cofounded and is employed by Calciscon AG (Bern, Switzerland), which commercialized the T50-Test. We would like to thank Dr. Shyamal Palit for his assistance with patient recruitment. Support for this study was provided by the National Institutes of Health/National Institute of Diabetes and Digestive and Kidney Diseases K23 DK087859 and the National Institutes of Health/National Heart, Lung, and Blood Institute R01HL132868. Because M.C. is a Deputy Editor of the Clinical Journal of the American Society of Nephrology, he was not involved in the peer review process for this manuscript. Another editor oversaw the peer review and decision-making process for this manuscript. See related editorial, “Metabolic Acidosis and Cardiovascular Disease Risk in CKD,” on pages 1451–1452. This article contains supplemental material online at http://cjasn.asnjournals.org/lookup/suppl/doi:10.2215/CJN.00380118/-/DCSupplemental.